15 AUG 2015 - This past 2015 Pacific Games had historic implications for the FSM on different levels. This was the first time in FSM history that it sent a team of boxers to compete at the Pacific Games. 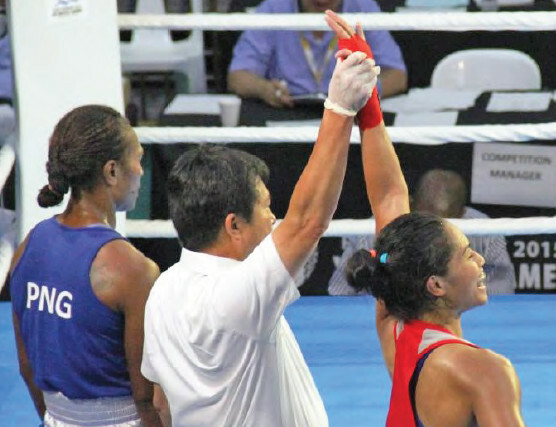 This is also the first time in 52 years since boxing became a competition in the Pacific Games that it allowed the sport of women's boxing in three Olympic Categories, 48-51Kg, 57-60Kg and 69-75Kg. Team FSM sent three male boxers, Derick Perman, Angelo Rodriquez, and Royce Rott of Pohnpei State to make their first ever competition debuts at the Pacific Games. The FSM team was anchored by one female, the highly experienced Jennifer Dugwen Chieng. Her accomplisments at the time included being ranked the Number #2 Women's Amateur Boxing's Lightweight fighter in the United States, the 2015 NY Daily Golden Gloves Champion, the 2014 USA National Silver Medalist, the 2014 Metro Champion, 2012 - 2013 WPAL Champion, the 2014 FSM Athlete of the Year, and one of four FSM athletes to be awarded an Olympic Solidarity Scholarship the past year. All FSM Boxers made their weight at the General Weigh-In morning and received their opponents and dates to compete as follows: July 14- Derick Perman v. Teata Teihoarii (Tahiti) in the 69kg, July 15- Angelo Rodriquez v. Tautuarii Nena (Tahiti) in the 75kg, July 16- Royce Rott v Tom Boga (PNG) in the 64(kg) and Jennifer Chieng v. Hatara Lagana Ioane (Tahiti) in the 57-60kg. In Derick Perman's bout he immediately went to work on the Tahitian by mixing hooks to the body and head and throwing overhand rights to the taller fighter. The fight was at a blistering pace based on the excitement of the fighter. For some reason the referee, to our shock and disbelief, gave Derick three standing eight counts when he never once hit the canvas. The referree's action called a stop to the fight. Derick took the loss very hard in the locker room where even other fighters consoled him by telling him not to worry as he is very young and has his whole boxing career ahead of him. They assured him that he will bounce back. "I'm fine, I never was stunned, hurt or felt outclassed", Derick said in the locker room after the fight. "I know what hurt is. I've been more hurt in sparring sessions with my team mates using head gear and bigger gloves which caused me to stop. It is what it is. I'm going to go back and train even harder." Derick fought like a warrior the entire time he was in there and we are all very proud of him for giving it 100%. He will be back better than ever! Angelo Rodriquez's bout was against Tautuarii Nena of Tahiti. It was clear from the first round that Angelo had more athleticism and power than Nena. He quickly earned Nena's respect by landing a couple of hard right hands. Angelo and Nena went back and forth for three rounds with the first round being a toss-up, the second round going to Angelo based on his aggressiveness and the third round going to Nena based on Angelo being too cautious. Ultimately the decision went to Nena. Angelo went back to the locker room and was of course highly upset with himself knowing that he gave away the fight. "I shouldn't have waited too long, and should have pulled the trigger more," Angelo said after the fight. Still, for his debut fight, Angelo showed he belonged with the best as he could have clearly won his fight if he had applied more pressure in the third round against Nena who's impressive record includes being the Silver Medalist at the 2015 Pacific Games and the France University Champion from 2011-2014. Royce Rott got the toughest draw assignment in the Light Welterweight class. He drew the light welterweight who was favored to win the Gold Medal, the highly experienced Captain of the PNG Boxing Team, Tom Boga. The fight was immediate fireworks with Royce and Boga trading full power blows causing two knockdowns and a stoppage, but not before Royce was able to land a 1 inch cut over Boga's left eye. Boga eventually went on to win the Gold Medal in the 64Kg class dominating opponent after opponent. "It was a great fight and I lost to a great fighter," Royce said. "I was never hurt, I just got excited. I'm sorry for letting down my country, but I will train harder next time and try my best." Royce gave an exciting fight by fighting like a lion till the end and didn't back down from the best fighter in the competition and even gave him a good cut as a parting gift. 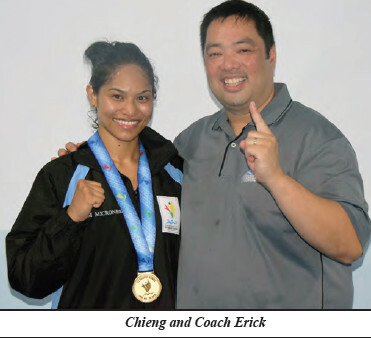 With all of the men on Team FSM now eliminated from the competition it was then up to Jennifer Chieng to attempt to win a bout for the first time in international boxing in Micronesian history and take home a medal. Jennifer's first fight was scheduled against Hatara Lagana Ioane from Tahiti. In that match she was able to win by split decision. It was the first win in the history books for a Micronesian in an international boxing competition. 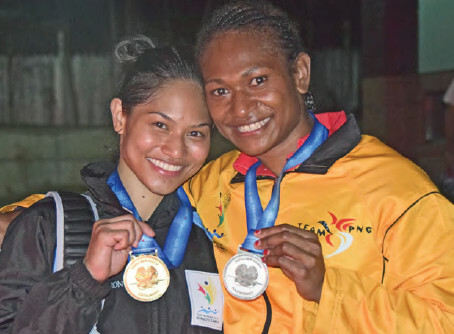 The next night Jennifer faced Raphaella Baki of Team PNG for the Gold Medal Finals. Baki had about a two inch height and 20 pound weight advantage come fight night. As a former track athlete, Baki's physique was that of the highest caliber and was intimidating from the sheer size of her muscular body. She was Jennifer's biggest and most athletic opponent to date making it a very intimidating and ugly fight with lots of emotion. The fight was televised throughout the entire country and other Pacific Island nations. The Prime Minister of PNG and other dignitaries were in attendance at the arena watching the fight, along with 7 million Papa New Guineans backing Baki to win the Gold. Chieng had only a total of 9 Micronesians from the FSM contingent left in PNG. With practically no Micronesians in the arena to support her, it was then up to Jennifer to carry the weight of the entire nation of the FSM on her shoulders and bring back the Go ld. During the bout, during a couple of spurts Baki was able to crowd Jennifer with her sheer size and began brawling, which Jennifer obliged. The PNG crowd grew excited as it looked like Baki was getting the better of those types of exchanges. However, the cleaner blows were clearly landed by Jennifer with her left hooks and straight right hands. In the next couple of rounds Jennifer asserted her boxing superiority with better defense and clean power punch combinations that began to weaken her opponent. Baki's hands began to drop below her shoulders and her punches were thrown with no snap. Jennifer's entire physical demeanor changed as her confidence grew. She began to circle Baki with a swagger, her hands completely down and her lead shoulder forward like Roy Jones Jr. in his prime, and then without warning she lept and exploded with a 1-2 combination and then again, followed by two solid lead rights that were all landing at-will on Baki's face. Those combinations were followed by a straight right left-hook combo that finished the unanswered assault which lasted about thirty seconds. The FSM contingent along with the Tahitian and Tonga teams who were also watching the fight in the front rows started screaming and rooting for Jennifer too and yelling "MICRONEEESIA!!!" On the televised version of the fight the blow-by-blow announcer was yelling: "Chieng with a right hand!! And another!! And another!! And another!! Look at Chieng now!! She looks like Bruce Lee! Ready to attack, look at her eyes zeroing right in!! This is a terrific final! What a fight!!!" The proud Papa New Guinean's heart and chin was unbelievable too as Baki amazingly was able to take those fully loaded power punches from Jennifer without hitting the canvas and she remained in the fight. Baki retaliated with one more burst of punches to try to stem the momentum of Jennifer's stamp on the fight but to no avail as Jennifer didn't give her the opportunity. She landed more solid counter punches on Baki's face. The final bell rang and everyone in the arena knew they had just witnessed Chieng put on a masterpiece boxing clinic at the highest level. When we got back to the locker room, coaches from different boxing federations and members of the International Boxing Association (AIBA) who were present as technical advisors all congratulated Jennifer and told me that over the last two days, Jennifer put on the most impressive boxing display amongst all the fighters including the men. I asked Jennifer how much the win meant to her in comparison to winning the highly coveted 2015 NY Daily Golden Gloves tournament and the Silver Medal at the 2014 U.S. Nationals, two of the most prestigious boxing tournaments in the United States. She shook her head and said, "This victory means much, much more. All of my life I've watched athletes on television represent their country and stand at a podium and get awarded the gold medal with their nation's anthem being played and their flag raised and I can't believe its actually now happening to me. The whole event is now surreal. I just want to cry." As part of the first group of women ever to compete in boxing at the Pacific Games, Chieng was also the first female to win Gold at the Lightweight Division in the games. She was also the first Micronesian to win an international boxing match. She is also the first Micronesian female athlete ever to have won a Gold Medal in any sport at the Pacific Games. She had her dream moment as she took the podium and watched as the FSM flag was raised while the FSM National Anthem played. For Chieng it was an emotional moment but it was also emotional for everyone in the FSM contingent to see one of their own dominate a sport where mental and physical toughness reigns supreme. We were all so lucky to witness history thanks to Jennifer. Jennifer's win went viral in the FSM and also made international boxing news. AIBA's online news article called her "Micronesia's new hero", and a "sensation" who was able to "seal a memorable and emotional victory for herself and a proud nation." My good friend John Avira, President of the PNG Boxing Association and whose team won 8-13 Gold Medals making it the best boxing team in the Pacific, also sent me a congratulatory email regarding Jennifer's victory. He called her final bout a "magnificent win" and said that, "She was just awesome." For those of you who don't know much about Jennifer, she is not only a great boxer but an amazing person as well. Twenty-eight year old Jennifer Chieng was raised in the FSM states of Yap and Pohnpei. She attended Seventh Day Adventist (SDA) schools. Her father is Yapese and her mother is from the Philippines. She is one of six siblings. Jennifer is also a proud single mother of her four-year old son Adam who is her biggest fan! Jennifer graduated from Well's College and currently works in the finance industry as a Vice President for the Bank of New York. Although Jennifer may have moved from Micronesia to the mainland she is still definitely 100% Micronesian. Regarding being a role-model and representing the FSM, Jennifer said: "I'm just very happy and honored that I got this chance to represent my country in this tournament...I would encourage the youth especially all of the young women and men to find what they are passionate about and pursue it. I love this sport and so I hope that this win will generate more interest in boxing and more participation by the youth and everyone in Micronesia." Now that the 2015 Pacific Games are in the history books, Jennifer is on a quest to represent the FSM and all Micronesians to win the Olympic Gold Medal and put the FSM on the World sports map. In order to achieve that goal she plans to take a break from the finance industry this year in order to concentrate and train to qualify for the Olympics in Brazil 2016. Jennifer does need your individual support and the nation's support. You can personally make a difference today and help Jennifer on her quest to bring the Olympic Gold Medal to Micronesia by going to her GoFundMe page (www. gofundme.com/JenniferDugwenC) and making a donation. Any amount would be greatly appreciated and goes a long way for her training and preparation. Please help out and don't waste this opportunity. She is a highly decorated special fighter which the FSM may not see for some time to come. You can also follow Jennifer on her Athletes Page at "Jennifer Dugwen Chieng" on Facebook. Please also follow us too on the FSM Boxing Federation FB Page, where we will also post updates on Jennifer and the rest of the Team's members. Lastly, the FSM Boxing Association thanks all of our families and friends and everyone else for all their love and support to the boxers, coaches and everyone involved with the FSMBA. Thanks also to everyone who personally donated and organizations that helped provide funds for the Pacific Games to make this historic event happen including the FSM National Government, through the Office of the President and the Department of Health and Social Affairs. It provided a $200 stipend to each athlete and coach and funded some of the TEAM FSM uniform costs. The FSM National Olympic Committee funded all of the boxers' travel including Jennifer's trip from New York. It also funded stipends, insurance, warm-ups and team shirts, as well as PNG accommodation for a total of around $20,000. Local businesses also contributed to the entire FSM Team such as Palm Terrace Shopping Center, Etscheit Enterprises, Matson Navigation, the Bank of FSM, and Caroline Fisheries Corporation. Lastly, FSMBA thanks the people and government of Australia for funding its "Victory" project by providing a grant specifically to be used to help promote its boxers to be national role models and heroes, in order to help lead the battle against social and health problems in the FSM.